President Recep Tayyip Erdoğan said on Tuesday he expected more cooperation from its neighbor Greece in the repatriation of eight soldiers who fled to Greece following a 2016 coup attempt. Speaking at a joint news conference with Greek Prime Minister Alexis Tsipras in Ankara, Erdoğan said that Greece should not become a safe-haven for coup-plotters and terrorists, underscoring that disputes between the two countries could be resolved "peacefully" through dialogue. "We, as Turkey, believe all the problems with Greece could be resolved peacefully on the basis of fairness," he said. Earlier on Tuesday, Turkey updated a list of former military officers wanted for their role in a 2016 coup attempt to include the eight officers who have been granted asylum in Greece, with a bounty of 4 million Turkish lira ($770,446) each. Greece does not welcome coupists but the case of the eight soldiers is a matter of the judiciary, Tsipras said, adding that what is more important is "to strengthen our cooperation on security." "A politician's job is not to win enemies but friends... otherwise you constantly lose blood," Erdoğan added. Touching a refugee deal signed between Turkey and EU in March 2016, Erdoğan said the EU did not practice visa liberalization and the immigrant agreement, and urged the bloc to be loyal to its promises. In an interview, with Anadolu Agency ahead of his meeting with Erdoğan, Tsipras had called on the European Union to support Turkey as it hosts 4 million refugees. The refugee deal was signed between Turkey and EU in 2016 to find a solution to the influx of refugees heading to the union. The agreement foresees that in exchange for Turkey stemming the refugee flow to Europe, the EU would pay Turkey 6 billion euros in financial aid. The agreement also envisages acceleration in Turkey's EU accession talks and visa-free travel for its citizens. The EU had fully paid its first 3-billion-euro tranche for 2016-17 and promised to pay the second tranche by the end of 2018. Although Turkey did its part taking great responsibility, the EU has failed to hold up its end of the agreement – not paying the promised amount. The EU has also been delaying implementing visa-free travel for Turkish citizens for two years since the deal came into effect. The two countries had expressed their willingness to open a new page in bilateral relations during Erdoğan's historic visit to Athens in December 2017, which was the first in 65 years at the presidential level. Tsipras is now scheduled to visit Fener Greek Orthodox Patriarch Bartholomew in Istanbul Wednesday. He is also expected to be the first Greek leader to visit the Halki Seminary, a former Christian Orthodox school located on one of Istanbul's Princes' Islands. In recent years Erdoğan has suggested that the seminary could be reopened if steps are taken by Athens to improve conditions for the Muslim community in Western Thrace, an area of Greece with a large Turkish Muslim population. The election of religious leaders or muftis has been a key problem of Greece's Muslim Turkish minority of some 150,000, concentrated in the Western Thrace region, since 1991. Cyprus is another issue waiting to be solved between the two countries. The island has been divided since 1974 when a Greek Cypriot coup was followed by violence against the island's Turks and Ankara's intervention as a guarantor power. It has seen an on-and-off peace process in recent years, including the latest initiative in Switzerland under the auspices of guarantor countries Turkey, Greece and the U.K. collapsing in 2017. 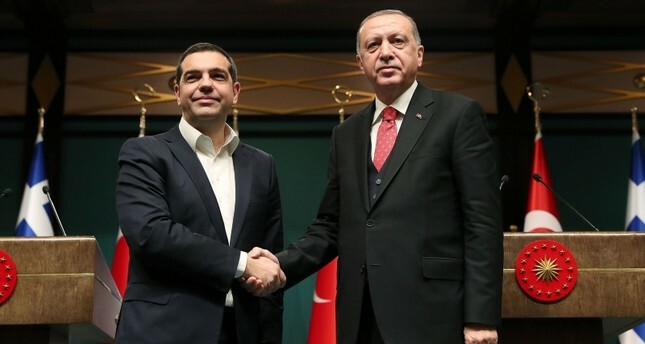 Speaking at the press conference with Tsipras, Erdoğan said that Turkey and Greece should create a "joint vision on Cyprus" and "the political equality of Turkish Cypriots must be a basic parameter of Cyprus talks." There is also a dispute over sharing gas fields in the Mediterranean. Turkey has consistently contested the Greek Cypriot Administration's unilateral drilling activity in the Eastern Mediterranean, saying Turkish Cypriots also have rights to the resources in the area.